The process for obtaining a patent can vary depending on the type of patent sought and the patent strategy which is best suited to your requirements. Prior to filing a patent application, we recommend conducting a patentability search to determine the eligibility of obtaining patent protection for your invention. The cost for us to conduct a preliminary patent search is $550 (including GST). Any relevant prior art found may prevent you from obtaining a valid patent or may need to be considered when drafting the patent specification. 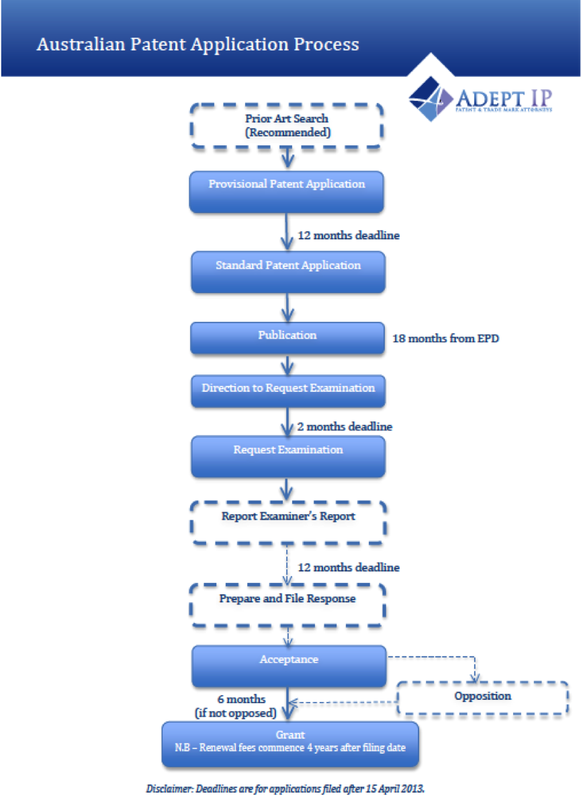 Usually the first step in the patent application process is filing a provisional application. The cost for us to prepare and file a provisional patent application is $2310 (inclusive of our service fee, GST and official fee). The main purpose of the provisional application is to establish a “priority” date, and provide a basis for a later-filed complete application. The “priority” date is the filing date of the application, and is the date from which your protection begins. It is useful in the early stages of an invention to allow the owner time to develop a working prototype of the invention and/or begin manufacturing and marketing the invention, to determine whether it will be commercially viable. It is essential that the provisional application describes all the features of the invention otherwise any new information added later will not have the priority date of the first provisional application. If improvements are made to the invention after filing a provisional application, it is possible to file another provisional application as soon as possible which describes the invention including the improvements. This allows a new priority date to be established for the improved invention. In order to maintain the priority date of the provisional application, a complete application must be filed within 12 months from the priority date. Alternatively, it is possible to file a complete application straight away in the country(s) of interest. This would generally arise where the invention is already fully developed, and you are confident you know what the inventive aspects of your invention are. In Australia, there are two types of patent protection available – a standard patent or an innovation patent. Complete patent applications may also be filed in one or more individual foreign countries or in respect of an international patent application under the provisions of the Patent Cooperation Treaty (PCT) if international protection is more appropriate. The complete application includes a complete specification which must fully describe the invention and best known method of performing the invention. All information that is critical to the invention must be included in the patent specification. It must also include one or more claims which define the scope of protection sought for the invention and determine the monopoly which the patent will provide. The wording of the claims must also distinguish your invention from the prior art. Once the complete application is filed, the application will be examined by IP Australia to assess its eligibility for registration. For a standard patent, IP Australia will issue a direction to the Applicant to request examination which, must be made within 6 months from the date of this direction. During the examination process, it will be necessary to provide the results of any official searches that have been undertaken (i.e. a search performed by IP Australia or a foreign Patent Office) that may be relevant to the patentability of the invention. The application will then be examined and the Examiner will search earlier published documents to determine if the invention is both new and inventive. The Examiner will then issue an adverse report raising any objections concerning patentability or formality requirements or issue a notice that the application has been accepted. If an adverse report issues, the Applicant is given the opportunity to overcome any objections raised by the Examiner. For innovation patents, IP Australia will only conduct a formalities examination following filing to ensure that the application is in order and all the necessary documents have been provided. As there is no automatic substantive examination at this stage, innovation patents are generally registered fairly quickly. However, it is important to realise that an innovation patent cannot be enforced until after it has undergone substantive examination and the patent has been certified. Substantive examination may be requested at any time after grant by the patentee or a third party. An application for a standard patent will be published and made available for public inspection about 18 months after its earliest priority date. Once a standard patent application is granted you may be entitled to take legal action for any infringements that occurred from the date of publication. Once through the examination phase, the application will then be accepted. For a standard patent, the acceptance and details of the patent will be published shortly thereafter, and once published, there is a three month period in which other parties can formally oppose the registration of the application. If there is no opposition, then the application will be granted as a Standard Patent upon payment of the prescribed acceptance fees. If examination is successful for an innovation patent, the patent will be certified and the patentee will be able to enforce the patent in the same manner as a standard patent. A standard patent can remain in duration for a period of up to 20 years, during which renewal fees will be required to be paid annually, beginning 5 years from the date of filing the complete specification, in order to maintain the patent. An innovation patent can remain in duration for a period of up to 8 years, with renewal fees beginning 2 years from the filing date and payable annually thereafter.